Without Microsoft Office Automation, Spire.XLS for Silverlight can help users realize Excel functions, including basic operation on Excel, Formatting, File Protection, Data importation/Exportation, Contents Inserting, Mark Designer etc. 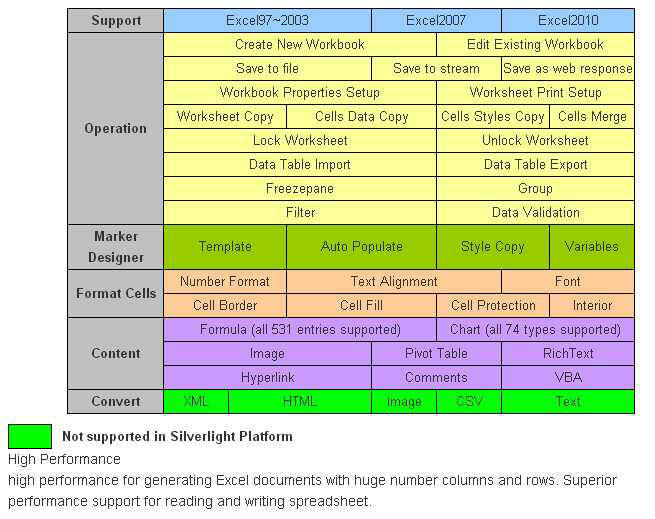 Spire.XLS for Silverlight supports Excel 97-2003, Excel 2007 and Excel 2010. However, Silverlight 3.0 or Silverlight 4.0 should be installed for using Spire.XLS for Silverlight. Spire.XLS for Silverlight enables users to create and read workbook, edit existed worksheet, save to stream/web response, set page and file properties, copy data, merge cells etc. Spire.XLS for Silverlight enables users to format cells, including data format, text alignment, font style and color, cell background color, borders etc. Spire.XLS for Silverlight enables users to encrypt Excel workbook, lock worksheet and cells. Also, it can decrypt workbook, unlock worksheet and cell. Spire.XLS for Silverlight enables users to import data from datatable to workbook and export data from workbook to datatable. Spire.XLS for Silverlight enables users to insert internal and external contents in Excel. User can insert Formulas (all 531 entries supported), Charts (all 74 types Supported), Pivot Table, Comments, VBA, TextBox, Image, Hyperlink etc. Spire.XLS for Silverlight enables users to use mark designer in Excel. Before using mark designer, template with formatting is necessary.